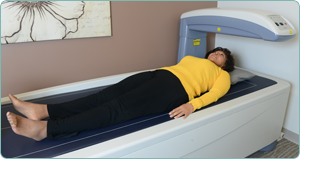 Since 1984, OAC has provided state-of-the-art Dual Energy X-ray Absorptiometry (DEXA) bone density testing. We have centers at each of our six locations. Our centers specialize in the diagnosis, prevention and treatment of osteoporosis and other metabolic bone diseases in both women and men. We were the first to offer DEXA testing in the Washington, D.C. metropolitan area. We continue to offer DEXA scans by certified technologists and complete DEXA interpretation and reports by certified physician Clinical Densitometrists. Osteoporosis is a disease characterized by bone loss and diminished bone strength resulting in an increase in the risk of fractures. Many factors determine who will develop osteoporosis. The more factors present, the greater your chances are of having or developing the disease. As you review the list of risk factors below, remember that early detection and treatment greatly minimize the effects of osteoporosis. It is a preventable, treatable disease. Gender: Women are four times more likely than men to get the disease, with Caucasian and Asian women most at risk. Age: Women over the age of 45 and those who have experienced menopause are at greatest risk. Calcium Deficiency: A low dietary intake of calcium can cause weakened bone strength. Sedentary Life: Physical activity increases bone mass, a sedentary lifestyle results in lower bone density. Body Size: Petite women are more at risk than heavier women because fat cells are sites for estrogen production. Family History: A familial history of osteoporosis increases risk. Cigarette and Alcohol Use: Cigarettes reduce effective estrogen levels, increasing the bone loss. Alcohol in excess of 2 drinks daily my impair calcium metabolism. Medications: Long-term use of corticosteroids, anti-seizure drugs, excess thyroid hormone, aromatase inhibitors, anti gonadotropin drugs, and antidepressants may accelerate bone loss and worsen osteoporosis. Does someone in your family have osteoporosis (thinning of the bones) or a history of hip fracture? The Osteoporosis Assessment Center (OAC) specializes in the prevention, diagnosis and treatment of osteoporosis and other metabolic bone diseases. We use state-of- the-art, dual energy x-ray absorptiometry (DEXA) technology to measure bone mineral density, currently the most precise of all bone density tests. Your bone mineral density indicates the strength of your bones. Our DEXA reports are unique in that they are crafted by rheumatologists with strong interest in osteoporosis. Attention is paid to all patient risk factors including medical history and important clinical findings. This information is incorporated into the DEXA reports to give the referring physician an excellent understanding of the DEXA results, fracture risk (FRAX) and insight into clinical management of bone density issues. The latest clinical guidelines and latest clinical studies are used as the basis for our clinical recommendations. The OAC clinical studies program enables patients and community members to gain access to select drug protocols not routinely available elsewhere. Through this program, our physicians and clinical research coordinators work with pharmaceutical researchers to evaluate the effectiveness of new medications for osteoporosis. Patient education is an important function at the OAC. Staff regularly provide information to help individuals understand and manage osteoporosis. We maintain a collection of current resources and reference materials for patients and the community. Our Wellness Program offers classes to increase osteoporosis awareness while incorporating exercise to improve bone density, muscle mass, range of motion, balance and posture. When you come for your DEXA screening, our receptionist invites you to sit in our comfortable reception area and fill out a detailed medical history form. Assistance, if needed is readily available. DEXA screenings are painless and non-invasive. Many patients have even said they find them relaxing. While lying still on a padded table, our DEXA technician moves the arm of the equipment to the mid-section of your body. A computer, which is interfaced with the equipment, prints out a color image of your bone mineral density. During the procedure, which takes about 45 minutes, the technician gathers additional information about your current physical condition and lifestyle. A full report of test results is sent to your primary care physician in approximately one week. Our receptionist maintains a list of many of the insurance carriers that cover this procedure. Click here to view Participating Insurances. Because carriers frequently change their reimbursement schedules, this list changes regularly. If you are unsure about the terms of your coverage, please call your carrier directly to find out if they cover dual energy x-ray absorptiometry, DEXA. For your convenience, we will file your insurance claim. At the time of service, we will ask you to pay the deductible and co-pay. Please note, you are responsible for all costs not covered by your insurance plan. If you do not have insurance, or if this procedure is not covered, our staff will gladly arrange a payment plan prior to the procedure. We also accept Visa, MasterCard, American Express, Discover, cash, and checks. Please complete the forms in advance and bring them with you to your appointment. Wear something that does not have metal buttons, zippers or hooks around the waist and hip area. Avoid taking medication that contains calcium (i.e. : calcium supplements, multivitamins, Tums, etc.). You may take all other medications, including osteoporosis drugs like Fosamax, Miacalcin, Actonel, Evista, etc. Allow at least a two week interval following any previous x-ray study involving contrast (like barium). There is a weight limit to our DEXA table. If your weight exceeds 300 pounds, it is possible that only a single scan (of the distal forearm) can be performed. Each of our six convenient locations is equipped with the state-of-the-art technology and expert clinical technicians to provide you with services.